The Xaqt solution built on AWS enables us to perform preventive roadwork. We expect to save up to 50% compared to emergency repair. With a population of 2.1 million, Kansas City is a fast-growing city located in the heart of the United States. In the downtown area, the city has seen more than $2.1 billion in development over the past 10 years. Xaqt's urban analytics and intelligence solution helps policymakers better understand how cities function and drive innovation. It may be the thirty-seventh-largest city by population, but Kansas City, Missouri, is one of the smartest cities in the United States. Along the two-mile corridor of the Kansas City Streetcar, a $15 million public-private partnership has supported deployment of 328 Wi-Fi access points, 178 smart streetlights that can detect traffic patterns and open parking spaces, and 25 video kiosks, as well as pavement sensors, video cameras, and other devices. It’s all connected by the city’s nearly ubiquitous fiber-optic data network. “I like to call it the smartest 54 blocks in the nation,” says Bob Bennett, chief innovation officer of the City of Kansas City. Xaqt has recently begun offering its solution on AWS Marketplace, providing a way for cities to easily deploy and test the core Smart City Engage platform including data integration, analytics, and data sharing and collaboration features. 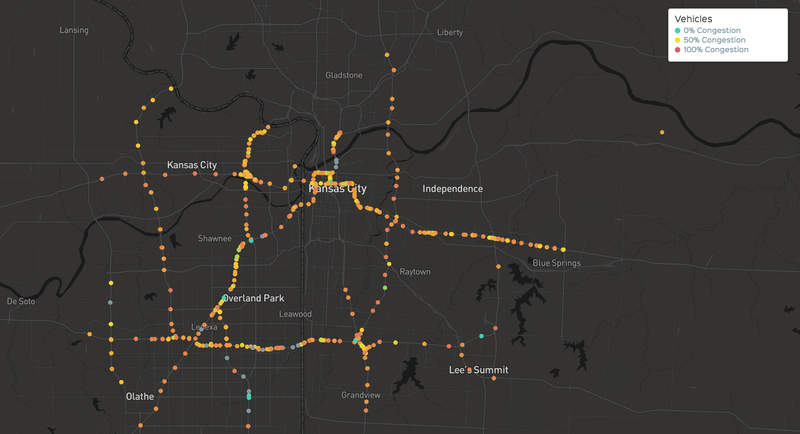 View of traffic congestion in Kansas City via the city's Xaqt dashboard. Advanced analytics are also helping the city identify vacant buildings, which typically need additional maintenance and attention. Xaqt combines datasets the city already has—such as permits and traffic—to pinpoint vacant structures with 85 percent accuracy. The city continues to move aggressively into the future. With Xaqt, it is looking at taking advantage of Amazon Alexa and Amazon Lex as public-facing interfaces to data, enabling natural-language voice queries such as “Where’s my bus?” It is also considering using automated chat bots in applications such as Facebook and Slack to tell people what their commute looks like. “Because of the cost structure and agility of AWS, we have been able to launch the Alexa pilot as a free service,” says Crosby. Learn more about using AWS for smart, connected and sustainable cities.